We are a specialist wood turning and wood carving store offering tools, machinery, timber and training. We have a great range of accessories for beginners and the experienced woodworker. A large variety of different timbers available as well as plenty of of kits to add value to your turned products. If you are after a Lathe or turning tools (including our Australian made Carbide Tipped Tools), dust extractors or sanders check us out. A large range of Finishing products as well. We now have a range of beautiful pen blanks specifically made for the Sierra Pen. 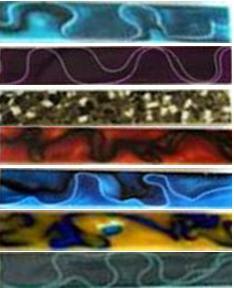 These are Pen Blanks made with special paper which is wrapped around the tube and set in clear resin. The result is a beautiful pen which you turn just as you would for either Timber or the acrylic pen blanks. Finishing is done with Micro Mesh and it gives a glass like finish which accentuates the beautiful patterns in the paper. Chioyogami is the name given to paper used for Origami - The art of Japanese Paper folding. We have selected some of the nicest patterns in a range of different colours for you to turn. In addition we have a number of "themed" patterns for specific causes. We will be expanding the available patterns over time. At this point there are 14 patterns to choose from. We stock a large range of Wood Turning supplies, wood turning tools including a range of Hamlet and P&N. Also some great machinery, wood polishes, exotic timber and a huge range of pens and accessories. Have you Tried Brass or Copper inlay? 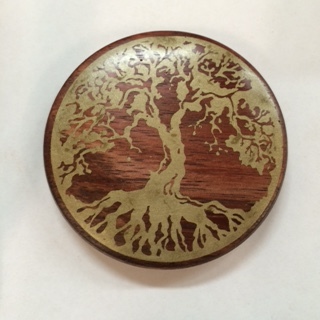 Brass or Copper inlay can have a big impact on the look of your work. 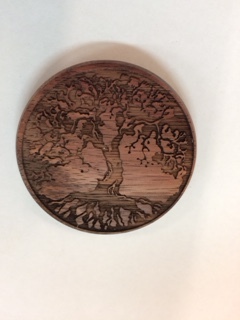 In the example on the right we have laser cut an image into a turned disc and filled with brass powder and super glue and sanded back to reveal the image. It is important to use thin super glue in a well ventilated area. Both copper and brass inlay powder are available in 100gm bags for $12.95. We can also arrange for laser engraving to be done if required. 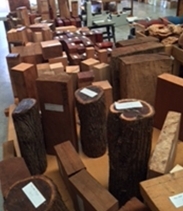 Burls and Banksia Nuts carving or turning timber come and see what we have. Large range of different timbers available. The on-line shopping cart is easy to use and completely secure. We have added a large range of Acrylic Pen Blanks at only $3.50 each. Check out the range of colours. There is also a great range of timber pen blanks to choose from. We have added a Video section which includes the videos we have throughout the site which discuss and demonstrate the products we offer. Please give us a call on03 9727 0611 if we can help in sourcing any specific materials. The ConChuck is a Split pin chuck and is unique in that enables any shape of wood to be held on the lathe with a single drill of a 22mm hole. For more detail please see the ConChuck on the left hand side pane. We have included a video on how the ConChuck works as well. One of the areas where we are providing master classes is in the process of using Stone inlay in turned timber. We are happy to provide these classes to woodworking clubs at no charge. 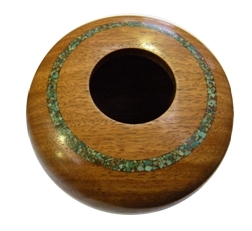 We now have a range of inlay stone available for inlay into turned bowls and platters. If you haven't tried it please come and talk to us about how to start. There is also a document on the Stone Inlay page of our website which will help you understand the process. There are a range of different types of stones available which have been sourced from Mount Isa. These include Malachite, different shades of Calcite, Azurite and a range of others which give a great range of colours. At Pop's Shed we sort, crush and size the stones into four different sizes for your projects. We also have a range of Dremel tools and attachments for those who are into carving and aiming to embed stone or embellish with wood dyes. 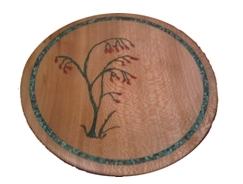 We have added a video on how to inlay stones into turned timber. Select Stone Inlay from the left hand pane to view the video. We are offering a beginners course in turning on Saturdays. This is a 90 minute course for beginners and attendees will make a pen in this first session. All materials are included in the price. Our training room is fully air conditioned and includes the latest in dust extraction. All tuition is done using variable speed lathes and of the 90 minutes we aim to have you "hands on" for around one hour. Also we offer an introduction to Bowl Turning course which runs for around 2.5 hours. Whether you're into turning or other forms of woodcraft it's definitely worth a trip to see what we have to offer. Please contact us for any additional information or if we can help you in any way.